The most OP weapon in Half-Life 2 despite getting it near the end of the game you have the pleasure of blowing enemies up into the sky and ragdolling them. The popular first person shooter of the 90’s had one very popular weapon, and this was the yep you guessed it the rocket launcher. It was the first game to truly experiment rocket jumping, which is very popular in the mod turned full-fledged game called Team Fortress. Despite the rocket launcher not being the most pleasing to the eye it is beautiful in that it is simple but super powerful! It was so widely used that there was even a ‘no rocket launcher’ option when finding online deathmatches. Despite there being many variations of the Rocket Launcher in Team Fortress 2, we are going to focus on the most iconic one in the game the Australium Rocket Launcher (aka the Golden Rocket Launcher, the Rocket Launcher allows you to do the famous TF2 move called the ‘Rocket Jump’ where you crouch and fire the rocket at the floor underneath while jumping up in the air causing you to jump, with experienced players able to move around whole maps in seconds using advanced rocket jumping techniques. Oh yeh, the rocket launcher is also useful in blowing up enemies and sentries to pieces, however beware of enemy Uber charges! 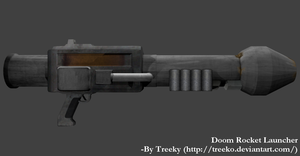 In my opinion, the original rocket launcher from the original Doom game is far better than the rocket launcher incarnation in the DOOM game released on May 13th, 2016. Despite the graphics not being great (the original game was released in 1993) you get awesome sound effects and also the crazy animations once you propel rockets into the enemy or barrels. 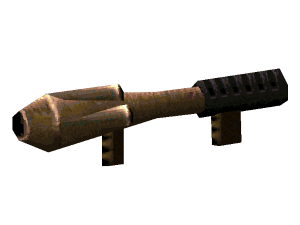 The most iconic rocket launcher in gaming by far the M41 SPNKR formally known as the Medium Anti-Vehicle / Assault Weapon. It has been in the Halo series from Halo Combat Evolved to Halo 5 Guardians. This surface to surface rocket launcher. The M41 is a very powerful weapon but its rocket speed is not the fastest and therefore is best used for vehicles.